In the past couple of months we had articles published in the CSTA Voice magazine as well as TCEA TechNotes newsletter. These magazines are targeted at High School teachers, and have led to an influx of over 150 teachers in the US and UK trying our site, with lots of very positive feedback. CodeAvengers.com provides interactive online courses that aim to teach web development to High School students in the most fun and effective way possible. The Code Avengers lessons include short coding challenges, games and quizzes that introduce, practice and review new concepts. The lessons contain minimal text, so students learn the ‘what’ and ‘why’ by completing carefully sequenced tasks, rather than reading lengthy explanations. By providing a gamified learning environment with points, badges and themed lessons, Code Avengers is designed to keep the attention of teenagers who struggle with finding time for homework, but always make time for computer games. 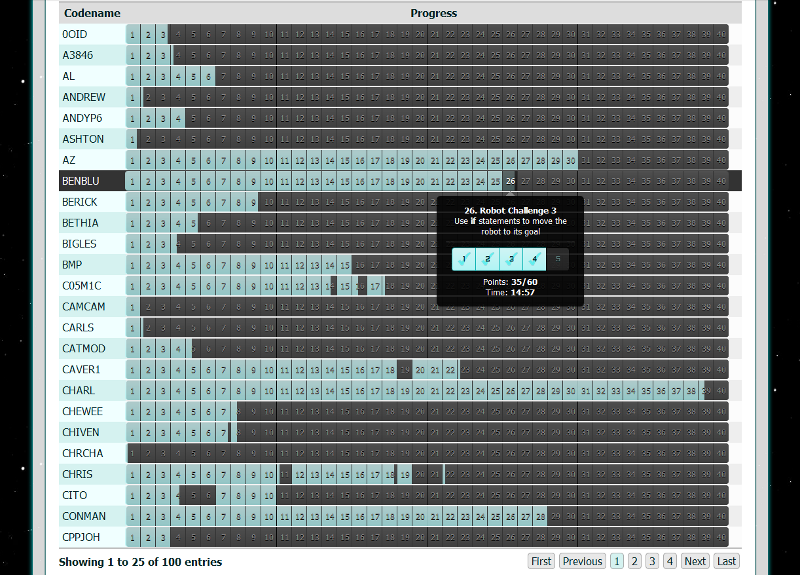 Code Avengers also offers great support for teachers, by providing live updates of student progress. The class progress page empowers teachers to easily identify and focus on the areas that the class is struggling with as well as the individuals that need the most help. Since Code Avengers is web-based, no installation of special software is required. This makes it easy for teachers to use the resource as both an in-class and homework activity. Whether in or out of the classroom students simply open their web browser to CodeAvengers.com and away they go. Later I introduced him to LightBot, an online game that introduces the basic computer programming concepts of selection, loops and functions; he completed the entire game in a single day. His attention was also captured by the themed, game like code challenges of HackThisSite.org, despite the level of difficulty exceeding that of a beginner. I tried many other free resources but none seemed provide what I need for my brother—a fun and effective web development tutorial for beginners. So I decided to create my own interactive tutorial, one that combined the beginner focus of w3schools, the fun factor of LightBot and the themed code challenges of HackThisSite. By doing so I hoped to make learning web development fun and maybe even addictive. To me, software development is such an exciting and rewarding activity. Why shouldn't learning the basics be just as stimulating? When I completed my final year of high school a decade ago, computing held the place of a “non-academic” subject, with no national examination and no points towards University entrance. Due to its inferior position in the high school curriculum, bright students were actively discouraged from taking it. Thankfully, the NZ Ministry of Education recognized the need for change. In 2011 a new “Programming and Computer Science” stream entered the year 11 (USA year 10) digital technologies course; rolling into year 12 in 2012, and year 13 next year. While, the new curriculum is a leap in the right direction, many of those teaching Digital Technologies don’t have programming backgrounds and find teaching the new material a challenge, especially given the lack of support, training and resources currently available. Code Avengers to the rescue! With this situation in mind, I planned to tailor my tutorials specifically to the New Zealand senior High School curriculum, with a focus on providing teachers with the support they need. After six months of development in my spare time, CodeAvengers.com went live in April 2012. Thousands of learners—including dozens of teachers in NZ and the UK—have used the site and given extremely positive feedback. At present Code Avengers contains two ‘Level 1’ courses that cover the NZ year 11 (USA year 10) web and programming curriculum. While targeted at senior high school students, the lessons have also been successfully trialed with younger classes. In the Level 1 HTML/CSS course, students create their own Superhero Profile as they learn the basics of web page creation in 20 short lessons with 5 tasks in each lesson. For each task students read brief instructions, write HTML and CSS code, and then view their results in an embedded mobile phone emulator. Students are provided with a unique URL to view their profile on their mobile phone and share with their friends. Later lessons encourage students to collaborate by linking each other’s profiles and creating a Code Avengers team page. So what are you waiting for, help your class become Coding Superhero’s with CodeAvengers.com! We have been having some great fun here in New Zealand. Check out this recent article about the Prime Minister writing his first line of code using Code Avengers! Mr Key learnt his new skill during a visit to technology company Orion Health using a New Zealand-made learn-to-code software programme. Created by PhD student Michael Walmsley, Code Avengers uses cutting-edge learning principles to make learning to code simple, fun, intuitive and addictive. 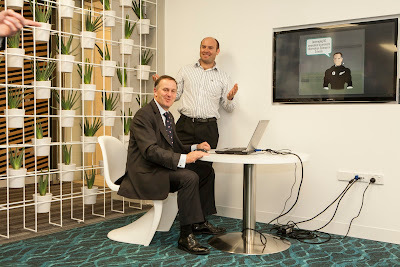 Using the Code Avengers programme, Mr Key was able to write his first lines of code and see the results within minutes – a digital avatar of himself. Sporting an All Blacks jersey, Mr Key’s avatar flashed onto the screen with a message saying “Leveraging NZ innovation to promote information science in schools”. Orion Health test team leader Michael Trengrove, who guided Mr Key through his first coding lesson, explains. A lack of good resources for school teachers to use in order to teach the basics of IT is another part of the problem, Mr Trengrove says. That’s where Code Avengers comes in. As part of an Orion Health-sponsored project to teach coding basics to disadvantaged teenagers in Christchurch, Mr Trengrove tested two learn-to-code programmes – local product Code Avengers and US product Codecademy. Released with a lot of hype late last year, Codecademy utilised its $10 million start-up capital to design a slick looking product with an impressive website. Code Avengers, on the other hand, cost less than a $1,000 to launch with little fanfare and no fancy website (yet). However, when it came to getting the teen coders to use the programmes, Code Avengers left its big, American rival eating dust, Trengrove says. “We found with Code Avengers that although it didn’t have the $10m of venture capital behind it and it was developed by a single PhD student, the pedagogy outstripped the well marketed American rival.